A primary feature of Venezuelan life is that politics is not only discussed but is everywhere, and as such, many Venezuelans could teach graduate courses in political science. This is well exemplified in a recent news item on the Real News Network in which a woman on the street, clutching a well-worn copy of the constitution, says to the interviewer, “If Juan Guaidó needs a constant reminder” she “will be happy with her fellow citizens to read him the constitution every day”.1 That a factor of everyday life is the importance of the Venezuelan constitution is not to be discounted and helps us understand something essential: the gravity of politics for Venezuelans. Another core aspect of this is the ease with which poor Venezuelans viscerally, expressly, and collectively are directly involved with politics. It was not always thus. In 1989, in the wake of re-electing Carlos Andres Perez as president, Venezuelans were hopeful. However, in the week after his inauguration, Venezuelans learned Perez intended to integrate the state even closer with global capital, pushing further austerity. In response, on February 27, 1989, a series of bus and food riots started that lasted almost a week. This revolt throughout Venezuela by the poor against the state and society was called the Caracazo.4 In its attempt to quell the revolt, the state killed upwards of 2000 people.5 Nevertheless, since the Caracazo, the state and elites found themselves unable to govern Venezuela as before. Rather than the elites governing Venezuela, the poor, those who were starving, those informally working, other workers including the underemployed or unemployed, farmers, Afro-Venezuelans, Indigenous Venezuelans, the differently abled, LGBTQ, youth, seniors, women working in their homes caring for their children, women working outside the home and then keeping house, people forgotten by politics of exclusion, came down from the barrios,6 changing Venezuela. Consider that for the next decade the average number of protests grew to over 1000 per year, an increase from the pre-1989 average of 200, signifying that all-across Venezuela there were at least two protests every day during this period.7 In 1992, a Colonel in the Venezuelan army, Hugo Chávez Frías, led an attempt to end the state’s continued repression, and when this failed, he took responsibility for it. Chávez, born poor, being Afro-Indigenous, recognized that the marginalized had to be the major force in any political project geared toward their particular and specific needs. On one hand, free or low-income housing, universal healthcare, public and universal education (including the distribution of free tablets or computers to all children), subsidized gas, the provision of basic food stuffs to all who need it – the Venezuelan state’s social programs remain sturdy despite the manufactured economic and political crises of 2019. When I was there in July 2018, because the cost to print urban public transit tickets in Caracas was more expensive than the government was willing to make the price, public transit was free. Of course, Maduro remains accused of “buying votes” via these programs. No longer rulers of Venezuela, the old elites after Chávez’s death in 2013 and with the subsequent fall of oil prices, saw an opportunity to reassert themselves, attempting to construct a perfect storm by increasing their economic war against their fellow citizens. Excluded from their “natural place” at the top of state and society, the elites remain frustrated; they have been ineffectual against the masses. World leaders as “diverse” as Trudeau, Harper, Martin, and Chrétien9; Bush, Obama, and Trump; and many others of Latin America, and the European Union have also long hated the revolution. 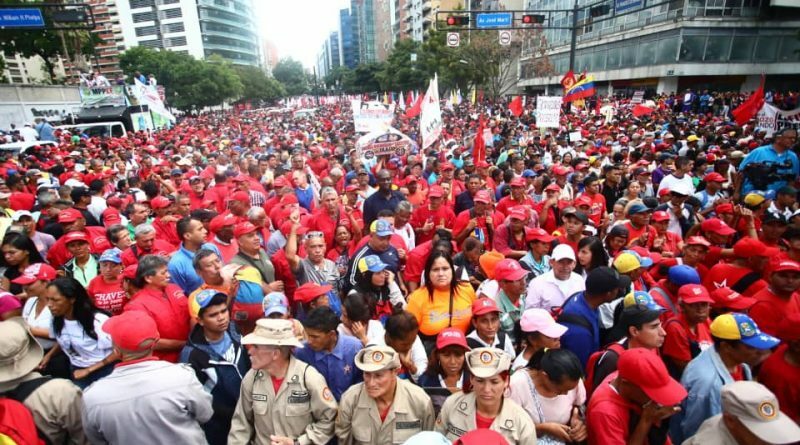 There are many reasons for the Imperial desire to end the Bolivarian revolution, including wanting to suppress the control and involvement exercised by the Venezuelan people over themselves. The fact that Venezuela is rich in natural resources such as petroleum, natural gas, gold, bauxite, iron ore, and diamonds just adds to the frustration with the revolution. These “leaders” have contributed to the economic war with ever increasing sanctions (especially since early 2015) and blockades of imported essentials such as medicine, food, and other goods – a war that has had quite a violent outcome against a sovereign people. Presently, high inflation is a serious problem in Venezuela, but significantly, neither production nor distribution are under government nor specifically community control. Private ownership and the imperial blockades strangle the Venezuelan economy, “making it scream.”10 An example of how Venezuelans resist this problem can be seen in the growth over the last decade of urban cultivation, and in their return to the land to produce what they need. See Dimitri Lascaris, “In Caracas, Ordinary Venezuelans Speak to the Real News About Venezuela’s Crisis,” (at 7m, 29s), The Real News.com, 2019. Both; Steve Ellner, Daniel Hellinger, ed., Venezuelan Politics in the Chávez Era: Class, Polarization and Conflict, Boulder, CO: Lynne Rienner Publishers, Inc, 2003a; and Fernando Coronil, The Magical State, Chicago, IL: University of Chicago Press, 1997; are instructive here, but this is standard analysis amongst most scholars of Venezuela. See, for example, Sujatha Fernandes, “Barrio Women and Popular Politics in Chávez’s Venezuela,” Latin America Politics and Society 49, no. 3 2007: 106, an extremely important article for this argument. Means the explosion of Caracas. Although one of the original points was Guarenas, a feeder city for the working (both formal and informal) of Caracas, and so technically outside of Caracas, the rioting quickly became a development across Venezuela. See, for example, Michael Coppedge, “Exploring Democratic Deterioration in Venezuela through Nested Inference,” in The Third Wave of Democratization in Latin America, ed. Frances Halgopian; Scott P. Mawhiring (New York, NY: Cambridge University Press, 2005), and Steve Ellner, Rethinking Venezuelan Politics in the Chavez Era, Boulder, CO: Lynne Rienner Publishers, Inc, 2010a, 95. Spanish for neighbourhood – tends to especially signify the very poor areas of Latin American cities. See Margarita López-Maya, “Venezuela after the Caracazo: Forms of Protest in a Deinstitutionalized Context,” Bulletin of Latin American Research 21, no. 2 2002: 203). See, for example, Dario Azzellini, “Communes and Workers’ Control in Venezuela: Interview with Dario Azzellini,” 2018; or George Ciccariello-Maher, Building the Commune, Jacobin Series Brooklyn, NY: Verso, 2016. August Arnold points out that Jean Chrétien was the only Canadian leader to go to Chávez’s funeral. Chrétien also seemed to admire scrappy Chávez, of whom he said “[Chávez] had support of the people and he was loved by the poor of his country. He was kind of a Robin Hood.” However, he also stated that “[they] didn’t agree … ‘on many things’”; “The Trump-Trudeau Venezuelan Achilles’ Heel: The Civilian Military Union,” 2019. For the “special relationship between Canada and Venezuela,” see also; John Clarke, “‘Progressive’ Trudeau Government Attacks Venezuela,” 2019; Donald Kingsbury, “From Middle Power to Regime Change Specialist: Canada and the Venezuela Crisis,” 2019; Tony Seskus, “What Venezuelan Turmoil Could Mean for Canada’s Oilpatch,” 2019; Urooba Jamal, “Why Canada Wants Regime Change in Venezuela,” 2019, amongst others. As Nixon and Kissinger conspired to do in the Chilean economy against the experiment of socialist-democracy in the early 1970s in Chile. The subsequent special relationship between the coup of Pinochet and the U.S. on September 11, 1973 continues to explain the fear in Latin America of actions by the United States and Canada – see also the coup and leadership role of Canada against Honduras around 2008 and since. Thanks to Lynda Rodriguez for this insight. The point is in calling for invasion, with neither internal institutional support nor mass support, Guaidó shows his empty hand having no claim on the reality of the situation.